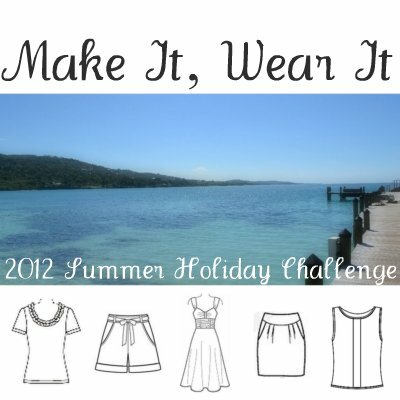 'Make It, Wear It' Summer Holiday Challenge - V.1 Completed | Jenny. Maker. 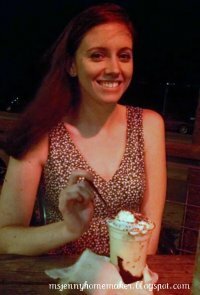 You may recall, I posted a challenge for myself, pledging that me-made items would account for 70% of my vacation clothing. Now that I'm back from Texas, the question is "Did she do it?" The answer? Day 1: I started the trip in 100% me-made fashion, cheating a bit by wearing my navy knit dress. I like wearing comfortable dresses on long driving trips and, as you well know by now, this dress is very comfortable. I forgot to take a picture but, I simply paired it with my unfashionable Nike comfort thongs (flip-flops). And, luggage, of course. Day 2: I sported my new yellow and white pleated skirt (to be blogged soon). With it, I opted for a navy polo, navy/white stripe flats, and pearl accessories. I tried to look a little more polished for this outfit so we could take pictures for my Sew Weekly post. Day 3: Another car trip (from Dallas to Galveston) so, I chose my me-made seersucker shirt and a khaki skirt. As a me-made bonus, I also wore my sailor-knot bracelet. Once again, I wore the Nikes (what can I say, I don't like to bring a lot of shoes on vacation and I've decided comfort is more important than fashion :-P ). And, once again, no picture. Day 4: We decided to do some outlet shopping in Houston* so, I wanted comfort (are we seeing a trend here? heehee) and something that would make trying on new clothes easy. I wore my recently shared Summer Breeze top, paired with the same white shorts, the Nikes and my rope bracelet (on which the salesman at JCrew complimented me :-) ) Unfortunately, I didn't remember to take a picture until I was eating my dessert around 10pm. Oops! Day 5: For dinner, we decided to go to a charming place with a disgusting name: Mosquito Cafe. I like to dress up a bit for dinner but, we were planning to sit outside so we could bring CoCo (there are no doggie daycares on the island!) so, I wore my seashell dress, my sailor-knot bracelet, and white wedge sandals. The evening did not go as planned and once again, we neglected the camera. Day 6: Time to go home! I had only "icing" dresses left with me so, I didn't wear any me-made garments for the car trip back :-( Shame, shame! Instead, I wore a cozy JCrew knit shirt/cotton shorts combo. I did wear my bracelet though. Technically, my goal for the challenge was not so much to stress over wearing several me-made items but, rather to push myself to finish some of the separates I had been planning. I finished the floral top and the yellow skirt specifically for this trip and only failed to complete one additional planned garment. So, I'd still call this challenge a success! Also, you may have noticed I sneaked V.1 into the post title. The reason being, as it stands, we're planning on taking an end-of-summer trip as well. So, I'll get a second chance to meet my 70% goal. I'll definitely need more tops and skirts by then! For those of you who decided to join me on this challenge, don't forget to share how you've done. Of course, summer has just begun and there are many more garments to be sewn and trips to be taken. Have fun! * Side-note/Confession: I realized in early May that, while I had not specifically pledged not to buy RTW, I had not done so once all year! So, I feel slighty guilty about our shopping day in Houston. I bought two knit tops, a cable-knit sweater, shorts, a belt, and the white shoes I mentioned above. Not much but, technically, I could have made the tops and the shorts. Though, I justified the purchases by the outlet prices, decent quality/construction, natural fabrics, and the unavailability of comparable fabric near me. This will also likely be the extent of my rtw purchases for at least the season, since the brands aren't available locally. Do you still shop ready-to-wear or are you boycotting the shops? I think you did a great job putting together a cute and functional vacation wardrobe! I've given up RTW clothes through June, after which I will probably buy things sparingly (stuff I wouldn't want to make myself). You should definitely think of this challenge as a success. As for your question, though I'm not actively boycotting shops, I don't enjoy shopping that much. With the influx of new clothes from sewing, I've in effect stopped buying ready-to-wear garments naturally. Thanks, Amy! It's been the same with me. I wasn't intentionally avoiding the shops but, with the number of items I've sewn, I've all but forgotten about rtw. I actually anticipated buying dozens if items at the outlets but, when we got there, I just wasn't very interested. I love your new skirt. Yellow is one of my favorite colors (and I think it is really hard to find a great yellow fabric or even yellow RTW item). You did a great job with this skirt, and it looks fabulous paired with a navy polo. You did pretty good for wearing handmade items on vacation. I had a tough time with that as well when I went to the cabin over Memorial weekend. I packed my two sundresses and it was windy, rainy and cold - so I never pulled the dresses out even once. Ahh, the RTW drama. I have tried not to buy much lately - but that is more because I don't enjoy shopping, so it is really hard to motivate me to go to the mall. I know that I can sew most of the things I want, but I also know that my sewing time is very limited. I say buy things you know you won't make time to sew (or knit), or anything that comes at such an amazing deal that fabric and pattern costs would be much more expensive. Thanks! That skirt is definitely one of my new favorite items! At least you had good me-made intentions :-) It's too bad the weather wasn't cooperative but, it sounded as though you had a nice time. It's fantastic you get along so well with your in-laws! Haha, yes, the drama. I think my guilt (which has now subsided as this post was written a few days ago) stemmed from these ongoing debates. I agree with you completely. There are some things I just have no interest in sewing. So, instead, when I actually do shop, I just try to buy quality items from respectable companies. Congrats on completing V.1!!! Your wardrobe is gorgeous. I am in love with the yellow skirt, but truly, everything looks beautiful. You did a fantastic job, and what a great idea for a challenge. As for the RTW issue, I've been so excited about sewing that I simply have no interest in anything in the stores. If I desperately need something I cannot make, I'll buy it. Welcome back, and thanks for the interesting challenge and for sharing your great outfits. You're selection of dresses looked just perfect for Florida! Hooray for a bonus me-made holiday! Love the yellow and white pleated skirt! Have you tried wearing it without the pleats in the lower part (i.e. ironing out the pleats beyond the point where they're actually sewed down)? It's be interesting to see how that changes the drape. It seems very stiff at the moment. Thank you! Actually, I only ironed the pleats themselves. The fabric below folds naturally. Looking at the photo above, I can see how it looks ironed. It's not quite so severe in person but, perhaps I should dry it to see if that softens the look.